The NASCAR Cafe in the Sahara Hotel in Vegas has just begun selling what they are calling “The Bomb” burrito. 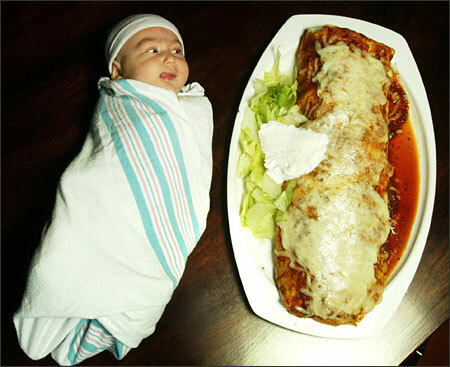 Said burrito is 2 feet long and tips the scales at 6 pounds. For those of you scoring at home, yes, that’s about the size of a newborn baby. If you don’t finish it, you have to pay the $19.95 it costs and then wear a pink shirt that says “Weenie”. If you do finish the burrito, then you get the meal for free, a t-shirt that says “I conquered The Bomb” and two unlimited passes on their roller coaster, after which you will promptly return the burrito to the hotel floor. It seems like a lot of these “it’s so big you get it for free if you finish it” things are in the wrong places. I mean throw this 6 pound burrito in any college town and that will be the most ordered menu item Thursday through Sunday. I know lots of people, myself included, who looked forward to paying for stale bread when we were drunk. Imagine if you had the option of downing 6 pounds of meat, cheese and tortilla for only $20. It would probably end all wars and bring peace in the Middle East. You are currently browsing the archives for the Vegas category.